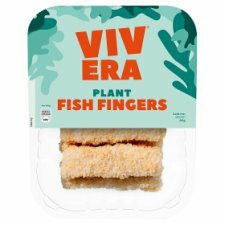 Vegan fish goujons made from wheat protein. Keep refrigerated below 5°C, once opened keep refrigerated and use within 2 days. Do not exceed use by date. Suitable for home freezing. This product has been previously frozen and defrosted under controlled conditions without affecting the quality or safety of the product. Once frozen use within 1 month. Heat for approx. 6 minutes in a pre-heated airfryer at 180 °C. Turn over half way.